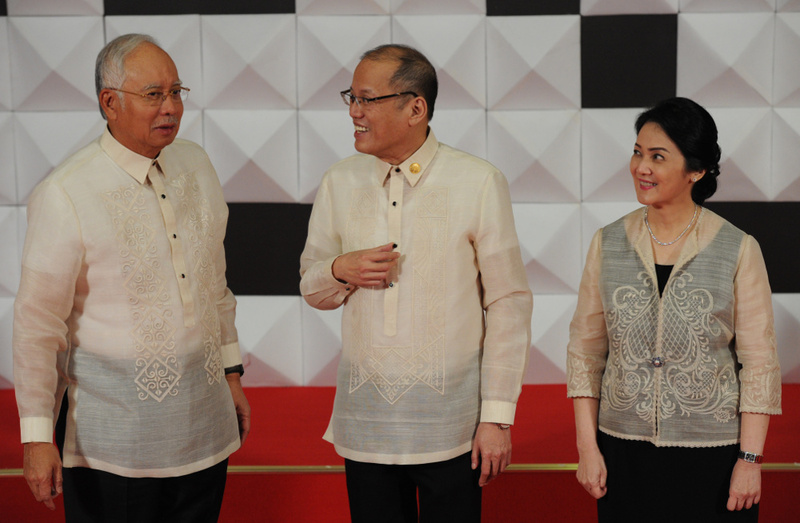 Malaysian Prime Minister Najib Razak (left) meets with Philippine President Benigno Aquino and Aquino’s sister, Maria Elena Cruz, at the APEC summit in Manila, Nov. 18, 2015. Najib said the execution of Malaysian citizen Bernard Then by Abu Sayyaf was not tied to his visit to the Philippines. Malaysian Prime Minister Najib Razak took to Facebook on Wednesday to condemn the al-Qaeda-linked Abu Sayyaf Group for executing countryman Bernard Then in the southern Philippines. “We call upon authorities to take action against those who have perpetrated this savage and barbaric act and ensure that they are brought to justice,” Najib said in a message posted on his Facebook page. Then, 39, was abducted in May from a seaside restaurant in Malaysia’s Sabah state, along with a Malaysian woman, Thien Nyuk Fun, AFP reported. They were taken by boat to the southern Philippine island of Jolo. The woman was released last week after reports that a ransom had been paid. Then was beheaded after ransom talks failed, Philippine police reported. On Wednesday, the Malaysian parliament offered condolences to Then’s family, the Straits Times of Singapore reported. MP Stephen Wong requested that his fellow parliamentarians observe a minute of silence, but Deputy Speaker Ronald Kiandee responded that such gestures usually were reserved for heads of states or lawmakers. “However, the Dewan Rakyat would like to record its sympathies to the family of Then that is facing a trying time,” Kiandee said, according to the Straits Times. Najib was in Manila for the Asia-Pacific Economic Cooperation (APEC) summit. The Malaysian leader denied that Then’s killing was linked to the summit, which has drawn leaders from 21 countries on the Pacific Rim. The Philippine government, meanwhile, has blamed the Abu Sayyaf Group for bombings, kidnappings and other terrorist acts. Last year, the group pledged its allegiance to the Islamic State (IS) extremist group. But many analysts believe that the two groups have little in common, and that Abu Sayyaf may have been looking to associate itself with the radical movement based in Syria and Iraq, AFP reported. The Abu Sayyaf Group usually prefers to hold foreign captives for lengthy periods – sometimes years – in exchange for ransoms.